The giant leaf frog has come up with an ingenuous way to get around leaving the comfort of its treetop home to reproduce. The female deposits her eggs in such a way that she may never have to leave her tree, but her young can easily access a body of water where they will develop. Every giant leaf frog love story begins with the male frog calling to the females, asking if anyone is interested in pairing up. The female then follows the call and seeks out the male. Males often fight one another for a chance to mate with a female and may even pull apart couples already engaged in the act. 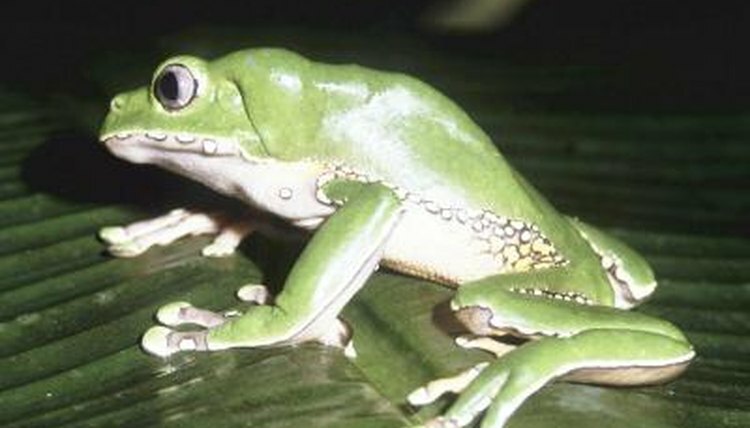 Giant monkey frogs can mate any time of year, but they do so most often from May to June, during the rainy season. After mating is complete but with the male frog still on her back, the female giant leaf frog looks for somewhere to build a nest, with the male's help. Next, the male and female build the nest in which to deposit the eggs. They usually take a few tree leaves and pull them together so they form a cup shape. The nest location is chosen so it hangs out over a pond, about 20 inches from the water's surface. It takes the female several hours to lay all her eggs. The eggs are clumped together in a gelatinous mass. The mother frog may need to take dips in the pond to replenish her water supplies during egg-laying so she can continue to produce the jelly that protects the eggs. Neither frog parent guards the eggs once they're laid, which means the eggs are often predated by birds, insects, mammals and other rainforest residents. After five to 14 days the surviving eggs hatch and the emerging tadpoles fall into the water below. Ideally the mother frog times her egg deposition so the tadpoles hatch during the height of rainy season, when the rain easily washes them into the pond from the nest. The bi-color tadpole develops in the pond. How long each tadpole remains in the aquatic life stage depends on temperature -- the warmer the water the faster the development. It can take six to ten weeks for a tadpole to develop past the aquatic stage. Once the giant leaf frog tadpole develops legs and no longer breathes through gills it can leave the water and head for the trees. The froglet can move about among the trees, even when it still has a tail. The baby frog has a healthy appetite and eats any invertebrates it can find to aide its growth. It can take several years to develop into an adult frog. Once the frog has completed its development it is able to mate and begin the life cycle again. Frog: A Photographic Portrait; Marent, Thomas; Jackson, Tom. Frogs, Toads, and Treefrogs: Everything About Selection, Care, Nutrition, Breeding, and Behavior; Bartlett, R.D. ; Bartlett, Patricia. PubMed.gov: Pharmacological Studies of 'Sapo' from the Frog Phyllomedusa bicolor Skin: a Drug Used by the Peruvian Matses Indians in Shamanic Hunting Practices.